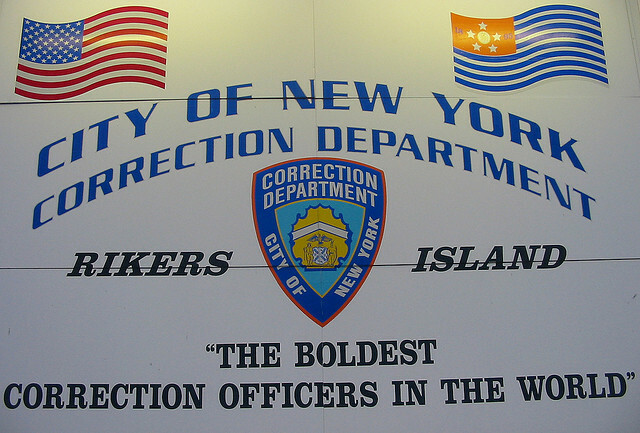 Are NYPD Protests Reaching Rikers Island? The first Rikers Island correction officer to be tried for civil rights abuses in more than a decade was found guilty on Wednesday by a jury for his role in the death of an inmate in 2012. Terrence Pendergrass could serve up to 10 years in federal prison for refusing to seek medical attention for Jason Echevarria, 25, a pretrial detainee, who cried out for help after swallowing a highly toxic packet of detergent that burned through his digestive tract. Mr. Pendergrass was found guilty of one charge of violating the constitutional right of a prisoner to receive attention for serious medical needs. His lawyer, Samuel M. Braverman, said he would appeal the decision, which was handed down in Federal District Court in Manhattan. This was the first time in over a decade that a Rikers corrections officer went to trial for civil rights violations. Before him was Roger Johnson in 1996, after he and several other Rikers guards beat inmates and then falsified reports. While I’m willing to give Braverman the benefit of the doubt that these were more off-hand remarks meant to explain away the guilty verdict than they were honest, deep analyses of the system, these kinds of statements are revealing nonetheless. If the protests are, in fact, moving juries to finally bring convictions against criminal Rikers guards, we should all go out and thank a protester today for bringing an end to an 18 year freeze in justice for inmates. But it remains to be seen whether this is an isolated case or the beginning of a thaw in legal accountability for Rikers officers. If it does continue, there is little doubt in my mind that we can expect to see the same reaction from them as we have from the NYPD and its unions. Rikers Island has its own history of lashing out against threats to their impunity that bares striking resemblance to the actions of the NYPD in recent months. Take, for example, the NYPD’s spectacularly tone-deaf effort to punish the blasphemers by engaging in a work slowdown, pledging to arrest people “only when they have to.” Overall arrests have fallen 66% since then the slowdown began and the city is still standing. Nonetheless, the incident showed that NYPD officers are beginning to push back while on the job, which is unsettling to say the least. But the NYPD slowdown is child’s play compared to the actions of Rikers workers in 2013, who blocked busses from taking inmates to court in protest of the prosecution of two brutally abusive officers, Kevin Gilkes and Louis Pinto Jr. The action appeared to have been designed to stop one particular inmate from getting to court to testify that day against Gilkes and Pinto, who had beaten him and attempted to cover it up. The judge was so disturbed that the inmate was being blocked from getting to court by Rikers officers that he stayed in session until the inmate arrived in order to make sure he was OK. The man who ordered the action is the same guy who is president of the Corrections Officer Benevolent Association (COBA) today: Norman Seabrook. It will be interesting to watch this all unfold on Rikers Island. While the majority of the protests have focused on police accountability, the NYPD currently faces no specific threat to their status quo. They have been treated with kid gloves this whole time. Even the introduction of body cameras, which apparently wouldn’t have mattered in the case of a videotaped killing like Eric Garner’s, was maybe one of the easiest and inconsequential “reforms” that could have been implemented at the department. But Rikers Island is in a completely different boat. In addition to feeling the heat of the protests, the Justice Department has joined a class action lawsuit against the NYC Corrections Department. De Blasio has already empaneled a task force on Rikers that has already made recommendations, and the mayor is said to be preparing to a long-awaited reform package. But no matter what (if any) meaningful reform comes to NYC jails, it is imperative that they go hand-in-hand with reform at the NYPD, which is the conduit through which arrestees enter the city’s massive and dysfunctional detention system. It also has to entail changes to the grand jury system and the ways in which courts have traditionally mistreated these cases. There is no avoiding the fact that there are going to have to be sweeping changes to the NYC justice system as a whole.